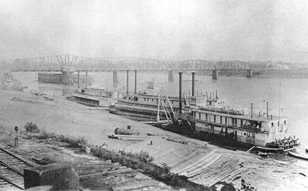 Port of Little Rock, Arkansas, 1850. Arkansas River Historical Society Museum. Slavers in Little Rock and Fort Smith waited anxiously, watching the ferries cross the Arkansas River to make sure that Black Seminoles didn't escape from the Territory. Around this time, Marcellus Duval became especially greedy: he informed the chiefs that 90 slaves would not be enough to compensate for his exertions, he would require more.